Microsoft tells The Reg that its ‘TenGrandIsBuriedHere’ competition "is designed to be a fun and entertaining way for PC users to experience some of the new features in Internet Explorer 8. The competition is only available to Australian residents and runs from 17 June through 17 September. The tone of the clues, instructions, and website reflects the spirit of competition we hope to create through this unique online challenge." You see, Microsoft has "cleverly concealed" a virtual voucher for that $10,000 on a webpage that only Internet Explorer 8 can view. 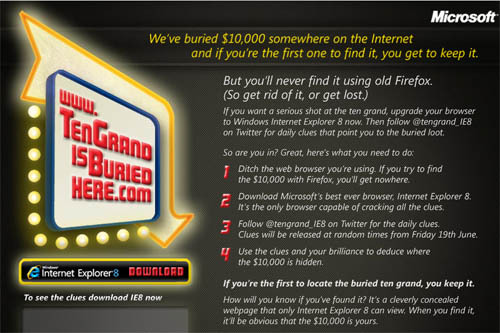 But to win the ten grand, you'll have to endure more than IE8. You'll also have to ingest some Web2.0rhea. Ditch the web browser you're using. If you try to find the $10,000 with Firefox, you'll get nowhere. Download Microsoft's best ever browser, Internet Explorer 8. It's the only browser capable of cracking the clues. Follow @tengrand_IE8on Twitter for the daily clues. Clues will be released at random times from Friday 19th June. Use the clues and your brilliance to deduce where the $10,000 is hidden. If you're the first Microsoft whore to find the dough, you get to keep it. Or at least part of it. Microsoft says "Tell your friends. It's not as stupid as it sounds. With all the stuff you have on, you won't be able to keep an eye out for all clues 24/7. So team with your friends to catch all the clues on Twitter." Thanks to Dom for the tip.